14 December 2017: A riot of colour and light dances through this peculiarly shaped galaxy, NGC 5256. Its smoke-like plumes are flung out in all directions and the bright core illuminates the chaotic regions of gas and dust swirling through the galaxy’s centre. Its odd structure is due to the fact that this is not one galaxy, but two — in the process of a galactic collision. 27 November 2017: A team of astronomers used data from both the NASA/ESA Hubble Space Telescope and ESA’s Gaia satellite to directly measure the 3D motions of individual stars in a nearby galaxy. The achieved accuracy is better than anything previously measured for a galaxy beyond the Milky Way. The motions provide a field test of the currently-accepted cosmological model and also measure the trajectory of the galaxy through space. The results are published in Nature Astronomy. 26 October 2017: Using the NASA/ESA Hubble Space Telescope, astronomers have discovered that the brightest galaxies within galaxy clusters “wobble” relative to the cluster’s centre of mass. This unexpected result is inconsistent with predictions made by the current standard model of dark matter. 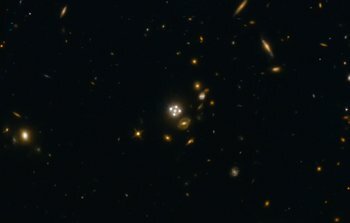 With further analysis it may provide insights into the nature of dark matter, perhaps even indicating that new physics is at work. 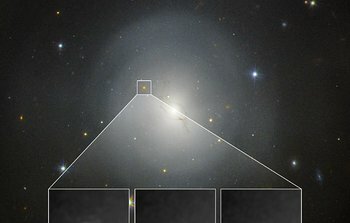 16 October 2017: The NASA/ESA Hubble Space Telescope has observed for the first time the source of a gravitational wave, created by the merger of two neutron stars. 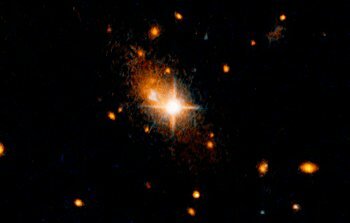 This merger created a kilonova — an object predicted by theory decades ago — that ejects heavy elements such as gold and platinum into space. This event also provides the strongest evidence yet that short duration gamma-ray bursts are caused by mergers of neutron stars. This discovery is the first glimpse of multi-messenger astronomy, bringing together both gravitational waves and electromagnetic radiation. 28 September 2017: This oddly-shaped galactic spectacle is bursting with brand new stars. 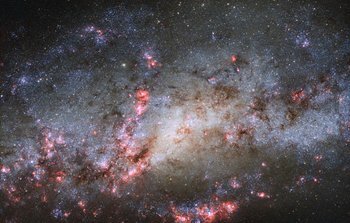 The pink fireworks in this image taken with the NASA/ESA Hubble Space Telescope are regions of intense star formation, triggered by a cosmic-scale collision. The huge galaxy in this image, NGC 4490, has a smaller galaxy in its gravitational grip and is feeling the strain. 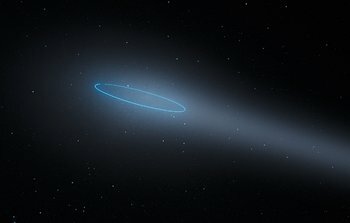 20 September 2017: With the help of the NASA/ESA Hubble Space Telescope, a German-led group of astronomers have observed the intriguing characteristics of an unusual type of object in the asteroid belt between Mars and Jupiter: two asteroids orbiting each other and exhibiting comet-like features, including a bright coma and a long tail. This is the first known binary asteroid also classified as a comet. The research is presented in a paper published in the journal Nature this week. 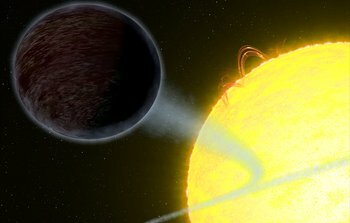 14 September 2017: Astronomers have discovered that the well-studied exoplanet WASP-12b reflects almost no light, making it appear essentially pitch black. This discovery sheds new light on the atmospheric composition of the planet and also refutes previous hypotheses about WASP-12b’s atmosphere. The results are also in stark contrast to observations of another similarly sized exoplanet. 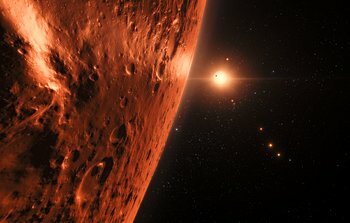 31 August 2017: An international team of astronomers used the NASA/ESA Hubble Space Telescope to estimate whether there might be water on the seven earth-sized planets orbiting the nearby dwarf star TRAPPIST-1. The results suggest that the outer planets of the system might still harbour substantial amounts of water. This includes the three planets within the habitable zone of the star, lending further weight to the possibility that they may indeed be habitable. 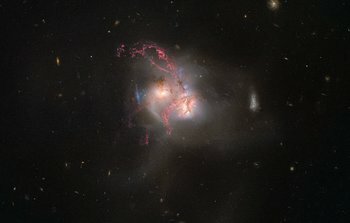 27 July 2017: The gravitational dance between two galaxies in our local neighbourhood has led to intriguing visual features in both as witnessed in this new NASA/ESA Hubble Space Telescope image. The tiny NGC 1510 and its colossal neighbour NGC 1512 are at the beginning of a lengthy merger, a crucial process in galaxy evolution. Despite its diminutive size, NGC 1510 has had a significant effect on NGC 1512’s structure and amount of star formation. 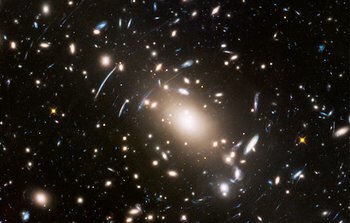 4 May 2017: The NASA/ESA Hubble Telescope has peered across six billion light years of space to resolve extremely faint features of the galaxy cluster Abell 370 that have not been seen before. Imaged here in stunning detail, Abell 370 is part of the Frontier Fields programme which uses massive galaxy clusters to study the mysteries of dark matter and the very early Universe. 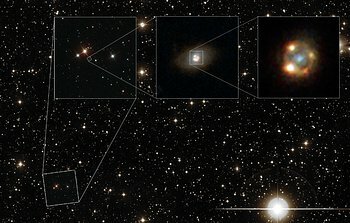 20 April 2017: A Swedish-led team of astronomers used the NASA/ESA Hubble Space Telescope to analyse the multiple images of a gravitationally lensed type Ia supernova for the first time. The four images of the exploding star will be used to measure the expansion of the Universe. This can be done without any theoretical assumptions about the cosmological model, giving further clues about how fast the Universe is really expanding. The results are published in the journal Science. 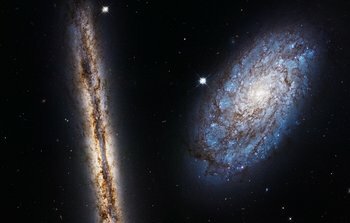 20 April 2017: This stunning cosmic pairing of the two very different looking spiral galaxies NGC 4302 and NGC 4298 was imaged by the NASA/ESA Hubble Space Telescope. The image brilliantly captures their warm stellar glow and brown, mottled patterns of dust. 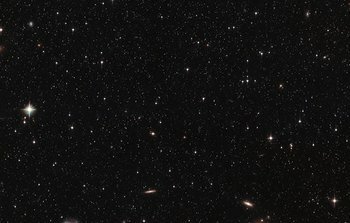 As a perfect demonstration of Hubble’s capabilities, this spectacular view has been released as part of the telescope’s 27th anniversary celebrations. 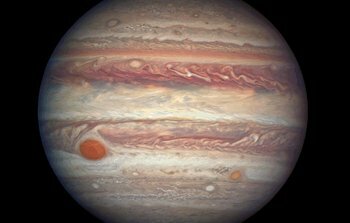 6 April 2017: During April 2017 Jupiter is in opposition: it is at its closest to Earth and the hemisphere facing Earth is fully illuminated by the Sun. The NASA/ESA Hubble Space Telescope used this special configuration to capture an image of what is by far the largest planet in the Solar System. This image adds to many others made in the past, and together they allow astronomers to study changes in the atmosphere of the gas giant. 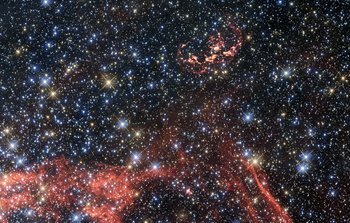 30 March 2017: Astronomers have used the NASA/ESA Hubble Space Telescope to observe the remnant of a supernova explosion in the Large Magellanic Cloud. Beyond just delivering a beautiful image, Hubble may well have traced the surviving remains of the exploded star’s companion. 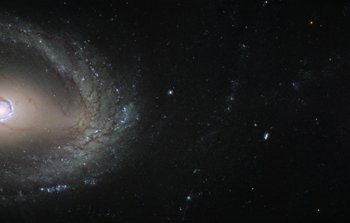 23 March 2017: An international team of astronomers using the NASA/ESA Hubble Space Telescope have uncovered a supermassive black hole that has been propelled out of the centre of the distant galaxy 3C186. The black hole was most likely ejected by the power of gravitational waves. This is the first time that astronomers found a supermassive black hole at such a large distance from its host galaxy centre. 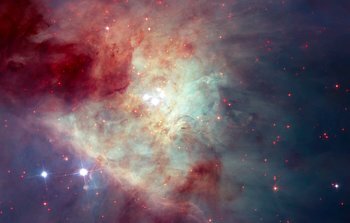 17 March 2017: In the search for rogue planets and failed stars astronomers using the NASA/ESA Hubble Space Telescope have created a new mosaic image of the Orion Nebula. During their survey of the famous star formation region, they found what may be the missing piece of a cosmic puzzle; the third, long-lost member of a star system that had broken apart. 24 February 2017: Three decades ago, a massive stellar explosion sent shockwaves not only through space but also through the astronomical community. 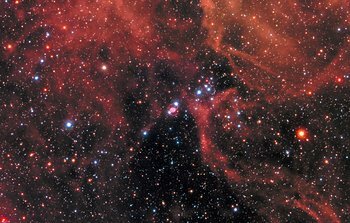 SN 1987A was the closest observed supernova to Earth since the invention of the telescope and has become by far the best studied of all time, revolutionising our understanding of the explosive death of massive stars. 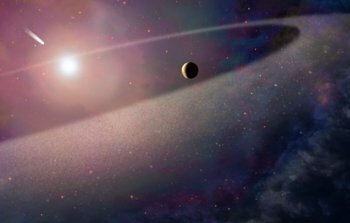 9 February 2017: Scientists using the NASA/ESA Hubble Space Telescope have observed, for the first time, a massive, comet-like object that has been ripped apart and scattered in the atmosphere of a white dwarf. The destroyed object had a chemical composition similar to Halley’s Comet, but was 100 000 times more massive than its famous counterpart. 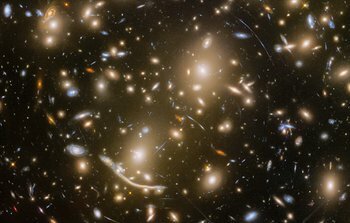 26 January 2017: By using galaxies as giant gravitational lenses, an international group of astronomers using the NASA/ESA Hubble Space Telescope have made an independent measurement of how fast the Universe is expanding. The newly measured expansion rate for the local Universe is consistent with earlier findings. These are, however, in intriguing disagreement with measurements of the early Universe. This hints at a fundamental problem at the very heart of our understanding of the cosmos. 20 January 2017: For 26 years, the NASA/ESA Hubble Space Telescope has been expanding our cosmic horizons. In capturing an astronomical number of images, Hubble has revealed and shared the beauty, wonder, and complexity of the Universe. 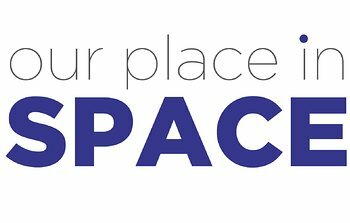 Now on 1 February 2017, a new exhibition called Our Place in Space will open in Venice, Italy. It will present a breathtaking visual journey, through our Solar System and out to the edge of the known Universe, alongside Hubble-inspired works by contemporary Italian artists.